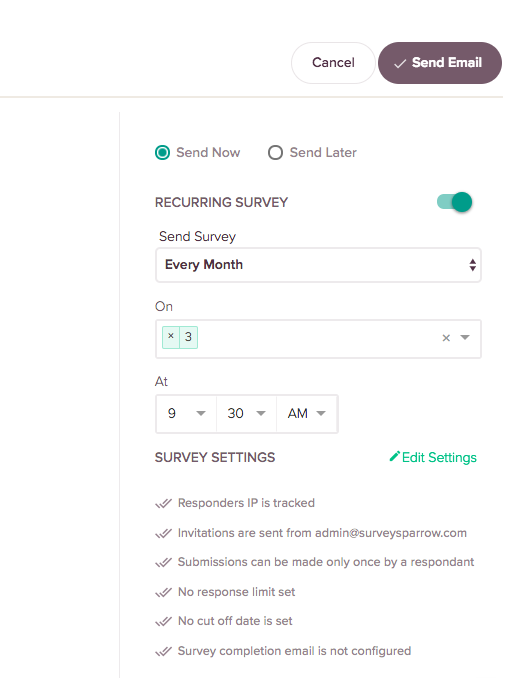 If you wish to send out surveys to measure your employee satisfaction periodically, SurveySparrow offers the recurring feature to help you. And this is a fully automated process which requires you only to configure the survey initially. Thus you can save the time lost while doing the process manually. You can share your survey to the respondents by email on a weekly, monthly or yearly basis. It is also possible to set the time, date and day to send out your surveys. 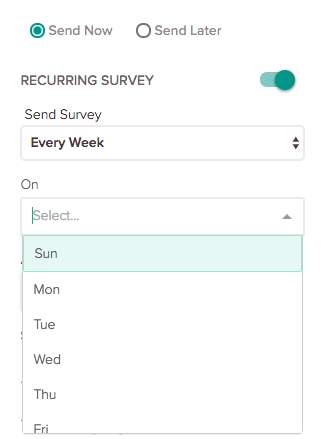 Once configured, your survey will be sent out to your respondents in the set date, time and recurring period. In the Share Survey page, you will find the various sharing channels like Email, Weblink and Social to share the survey. 2. Click the EMAIL option, and you will be redirected to the Email Share page. Here, you can find the RECURRING SURVEY icon on the right-hand side, and by swiping the icon right, you can enable this feature. 3. Now set the frequency of sending out the survey on a weekly, monthly or yearly basis. You can set the day and time using the drop-down options. 4. Once configured, click on SEND EMAIL icon to share your survey.